Adm. Frank Kelso, who died Sunday, was chief of naval operations from 1990 to 1994. January 1969 to August 1971 Commanding officer, U.S. Naval Nuclear Power School, Md. In the place where he was born and where he retired, he was known as a hometown hero who made it all the way to chief of naval operations, influenced men of power and maintained the humility of an ordinary guy next door. In Norfolk, where he served pivotal years in his 38-year career, Adm. Frank Kelso was a senior regional commander who helped run operations at the end of the Cold War and during heated years in the Middle East before being tapped to run the entire Navy. Kelso, 79, died Sunday after suffering a fall, according to Navy officials. He was in Hampton Roads visiting his son Robert, a Navy captain who was chief of staff of Navy Cyber Forces until this year. Kelso attended the high school graduation of his grandson, Robbie Kelso, who, following in his grandfather’s footsteps, will go to the Naval Academy in the fall. Kelso spent nearly four decades building a career from his days as a submariner to his place at the Navy’s helm. He led forces in strikes against Libya, helped rescue hostages of Palestinian hijackers, and oversaw a difficult drawdown of the Navy at the end of the Cold War. During that period, he realigned the Navy to work more closely with the other services. But he told a historian that despite his career of nearly four decades, he feared his name would always be tied to the 1991 Tailhook scandal, in which dozens of women were sexually assaulted during a convention of Navy and Marine Corps aviation officers in Las Vegas. “He lamented… that for many people, that may be the only thing people will remember about him – and he did so much,” said Paul Stillwell, who conducted 37 hours of oral interviews with Kelso as the director of the U.S. Naval Institute’s history division. The scandal marked the end of numerous officer careers and ultimately led Kelso to retire early. He said he had become “a lightning rod” and hoped his stepping down would shift the focus forward. Kelso was accused of witnessing abusive acts and turning a blind eye, something he vehemently denied, Stillwell said. Kelso’s two sons both served in the Navy, and two weeks ago he attended the graduation of a grandson who is headed into the Navy. Kelso led the Navy’s 6th Fleet in the Mediterranean Sea during the 1980s, leading the operation to capture hijackers of the Achille Lauro cruise ship and the subsequent air strikes on Libya in response to state-sponsored terrorism. He served in Norfolk from 1986 until 1990, first as commander in chief of the Atlantic Fleet and then as NATO’s supreme allied commander, Atlantic and as commander in chief of U.S. Atlantic Command. Retired Vice Adm. Robert Dunn, who commanded Naval Air Force Atlantic in those years, said he never saw Kelso fall short of his duties as a leader. Kelso became chief of naval operations in 1990 and served until his retirement in 1994. He oversaw the Navy in the Gulf War even as he managed severe budget cuts. Kelso realigned the Navy to meet new, tighter demands. He also supported the integration of women into more wide-ranging roles and command, particularly in the wake of Tailhook. In Fayetteville, Tenn., where Kelso is to be buried Saturday, businesses lowered flags to half-staff for a man described as a lifelong friend and active community leader, said Ann Hatcher, associate pastor at the First United Methodist Church. “He was a remarkable man and what has always impressed me so much about him was his humility,” said Hatcher, who knew Kelso from the time she was a young girl. 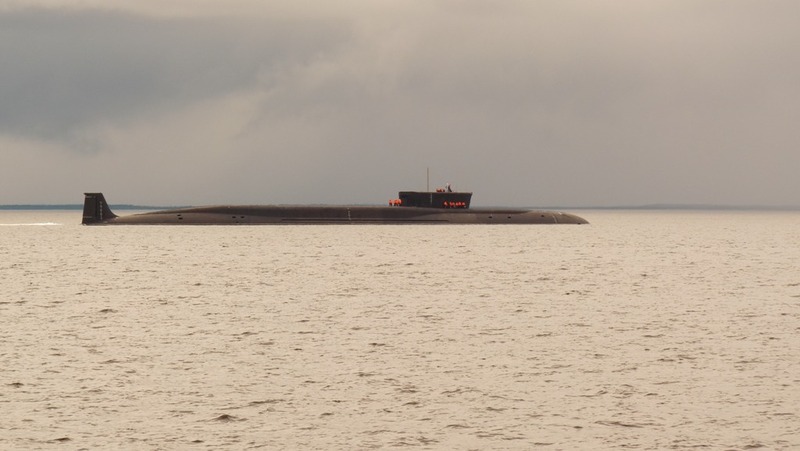 This entry was posted in US Submarines and tagged Admiral Frank Kelso, Submarine, Submariner on June 27, 2013 by jasonlockley. A MARINE Engineering Officer who had the “relentless” task of keeping a nuclear submarine at sea for 11 months has been awarded an MBE. Lieutenant Commander Andy Sharp was deployed aboard HMS Triumph in 2011 and 2012 when the boat was sent to the Gulf and Libya. The 45-year-old regularly faced repairing the ageing Trafalgar-Class boat but each and every time ensured HMS Triumph and her crew remained tightly on schedule. It continued: “Throughout that time Andy led his department with selfless dedication, tenacity and resourcefulness as they kept the submarine in a first class state of repair through what was, at the time, the longest ever operational SSN deployment. Also to be recognised in the Operational Honours with a Queen’s Commendation for Valuable Service was Warrant Officer 2 Alasdair McCall who supported Andy throughout the deployment. He said the MBE represented the hard work of an “excellent team”. The Lt Cdr was presented his MBE by the Queen at Buckingham Palace with his fiancee Kay Talbot and children Danny and Kirsty. His son Danny, a Royal Navy Air Engineering Technician, was flown off HMS Illustrious especially for the occasion. This entry was posted in UK Submarines and tagged HMS Triumph, Lieutenant Commander Andy Sharp, MBE, MEO, Royal Navy, Submarine on June 25, 2013 by jasonlockley. A Royal Navy submariner recently received US Navy Submarine Service “dolphins”, making him just the second UK officer to qualify on a US Navy submarine. It has been a tough process, but getting my US Navy dolphins is one of the highlights of my career and I have enjoyed every minute of it. 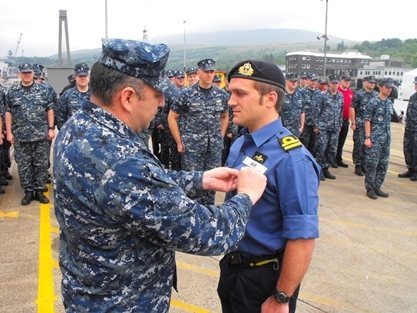 Lieutenant Matt Main has already earned his Royal Navy dolphins – the unique badge which signifies a qualified submariner – but on June 10 he was presented with the US equivalent after a gruelling 27 month training and qualification process. Matt, a Marine Engineer (Submarines) in the Royal Navy, was presented with the US dolphins by Commander George Perez, Commanding Officer of the USS New Mexico, after his success as part of the US-UK Personnel Exchange Programme. Fully integrated into the crew of USS New Mexico, Matt is currently the Damage Control Assistant and will become the Assistant Engineer in due course before returning to the Royal Navy. US Navy submarine officers must qualify both forward and aft to earn their dolphins and so, for Matt, learning to drive the submarine both surfaced and submerged has been a unique experience. “It has been a tough process, but getting my US Navy dolphins is one of the highlights of my career and I have enjoyed every minute of it. “After a fast-paced, demanding year of intense operations, Lieutenant Main has earned his gold US dolphins. “He is fully qualified to stand Officer of the Deck on USS New Mexico and will do so repeatedly over the next year as he assumes an even larger role in the day-to-day operations of the ship. Lieutenant Main was presented his dolphins during a ceremony alongside HM Naval Base Clyde. Witnessing events were the crew of USS New Mexico as well as Royal Navy colleagues. Matt is the second Royal Navy officer to earn US Navy submarine dolphins, with the first, Lieutenant Commander Ralph Coffey, receiving his after serving with USS Providence from 2010-12. This entry was posted in UK Submarines and tagged Royal Navy, Submariner, US Navy on June 20, 2013 by jasonlockley.